zeroK will host a booth and announce results at this fall's meeting of the American Vacuum Society in Long Beach, Ca. We will be giving a talk at this semi-application-focused meeting. I will be giving a talk and participate in a panel discussion at the FIB user group session of the upcoming ISTFA meeting. ISTFA focuses on failure ananlysis techniques emplying FIB and related technologies. The talk will focus on the latest applications of FIB:RETRO and the possible applications of SIMS:ZERO to semi. My brief talk will be back-to-back with one given by Rick Livengood of Intel who will summarize recent successful circuit edits performed with a FIB:RETRO platform. zeroK will host a booth at this fall's meeting of the American Vacuum Society in Long Beach, Ca. We also will have, in collaboration with researchers at Intel, a poster detailing recent successful circuit edits completed on 10nm node chip that were performed using zeroK's FIB:RETRO. This poster will be in the Thursday session, poster number HI-ThP02. zeroK will host a booth at this summer's M&M meeting. Since this is pretty nearby to zeroK's HQ we might facilitate some tours of our facility and/or a live demo. Please email us if this is of interest! This year's Electron, Ion and Photon Beams (3-Beams, or EIPBN) Meeting was fantastic; the organizers deserve a big thank-you. The Ion beam sessions where highly relevant and I came back with some great ideas. I believe both of my talks helps contribute to a broader understanding of LoTIS and what it can help our customers accomplish. If anyone would like to discuss further, please contact me! Hello everyone. zeroK will be contributing quite a good deal of content to this year's Electron, Ion and Photon Beams (3-Beams, or EIPBN) Meeting. First, I'll be giving a short course in collaboration with Anne Delobbe (our colleague at Tescan) on laser-cooled ion source technology. This will be on May 29th. A.V. equipment permitting, this should be a fun overview of how laser-cooling-enabled low-temperatures allow for the creation of high-precision ion beams. Later in the week (Thursday May 3rd 2:10 pm in room Caribbean 3) I will share the latest LoTIS technical results. zeroK's LoTIS brightness measurements appeared in the premier issue of the new high-impact journal Nano Futures. Now this publication has been honored as one of 11 articles highlighted in the first anniversary issue! zeroK participated in the FIB user group as part of The International Symposium for Testing and Failure Analysis (ISTFA). zeroK presented its latest results and discussed some of the benefits LoTIS may offer to members of this community. These include better machining acuity and reduced levels of primary-beam invasiveness. zeroK presented its latest results and spoke with experts in the FIB and SIMS communities at The 64th meeting of the American Vacuum Society in Tampa, Florida Oct 31st. Thank you everyone for coming out to say hello! Our booth was part of zeroK's outreach to the lead customers and users who will be among the first to reap the benefits of LoTIS-FIB instrumentation. Since last year when we debuted the technology we have demonstrated 4x higher brightness as well as quantitative spot size performance data from 1 pA to 1 nA with a 10kV beam. A new article was just published on nanotechweb.org highlighting the utility of zeroK's LoTIS. It provides a quick overview of our technology, its applications, and our recent publication. We are proud to announce that zeroK's LoTIS is now available to be deployed to lead users. If you are interested in being one of the first outside users of this new technology and would like to discuss acquiring a LoTIS-equipped FIB system or a retrofit of your existing gallium FIB system please contact us. The performance of the alpha continues to be refined. Recent upgrades have enabled a doubling of the ion source brightness compared with the results we reported in November. This means we can provide more current into smaller spots for our end users. Our most recent results detailing this work are now available in the premier issue of a brand new high-impact, rapid-release IOP journal Nano Futures. The article is open access so you don't need a subscription. zeroK is looking forward to a very exciting 2017. With an initial demonstration of our technology complete we aim to begin rolling out deployments to lead users. If you would like to discuss how this technology could benefit your application please contact us. 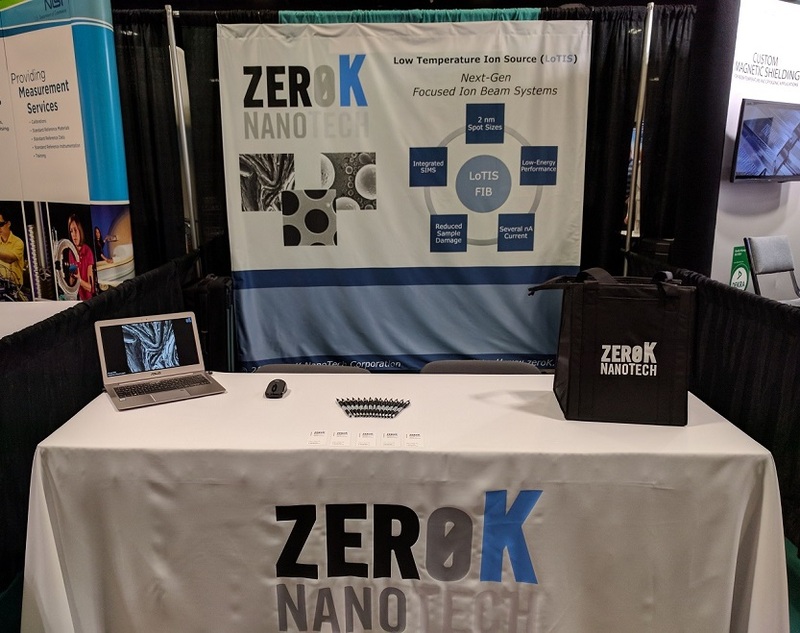 SemiEngineering.com: "zeroK NanoTech is putting a new and innovative twist on FIB"
Chemical and Engineering news: "Laser-Cooling is Changing the Ion-Beam Game"
Learn more about zeroK NanoTech, upcoming events, and past announcements. As always, please contact us to inquire further.